It’s time for a dessert again because I’m cravin’ some sweets! This recipe is one of those quick classics that you can throw together in under 15 minutes, let bake for 30 minutes and then you’ve got a cure for your sweet tooth. The best part about this recipe is that all of the ingredients are staple items in my pantry or refrigerator. I used raspberry jam but any jam that you have on hand will do! The handsome fish monger that gives me fantastic fish advice (among other things) had great idea for these bars. 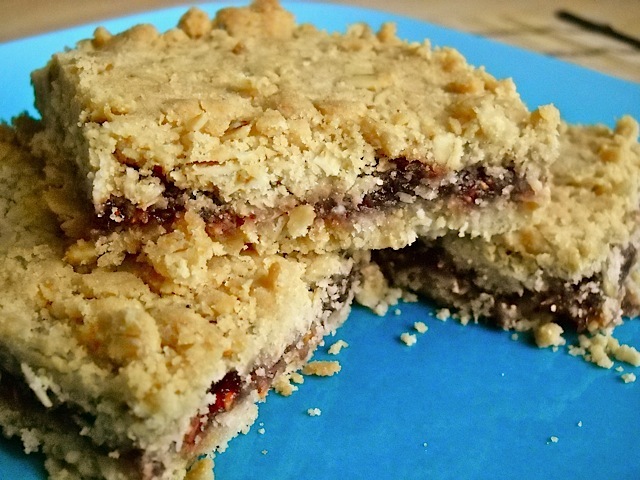 If you have some peanut butter, add a little bit to the jam layer for a wonderful PB&J crumb bar! Natural peanut butter would work best because when it’s warm it is kind of thin and you can “drizzle” it over the bar. These raspberry oat bars are rich and sweet and are made up of pantry staples that you probably already have on hand! Preheat your oven to 350 degrees. Spray a small glass baking dish (8×8 or 8×11) with non-stick spray. 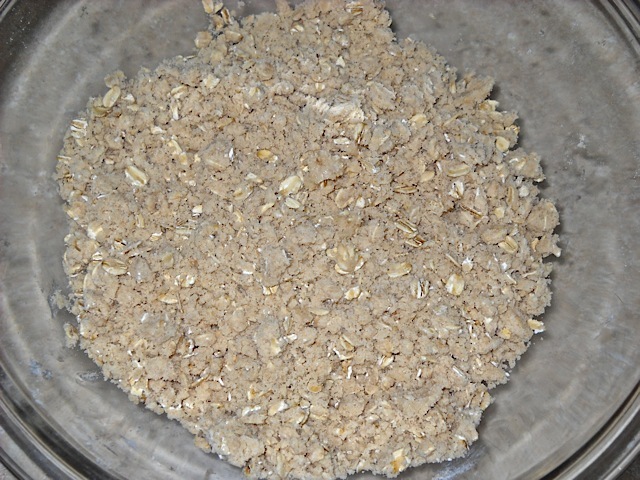 In a large bowl, combine the flour, brown sugar, oats, salt and baking soda. Mix well until all of the ingredients are combined and no sugar clumps remain. Using your hands, “smoosh” the room temperature butter into the dry mixture. Mix it very well until it is of even consistency. It should resemble a sandy/crubmbly mixture (see photos below). Evenly sprinkle half of the crumb mixture into the bottom of your glass pan. Press it down to make it compact. Carefully distribute the jam over the pressed crumb mixture. Drop the jam down in small bits because if you try to spread it, it will pull the crumb topping up off of the bottom of the dish. Keep the jam about 1/2 inch away from the edges so that it does not burn on the glass while baking. Sprinkle on the remaining half of the crumb mixture. Pat down lightly but do not completely pack it in like the bottom layer. 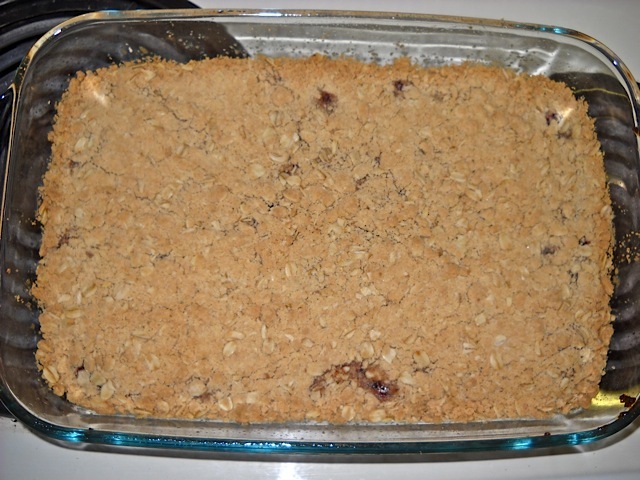 Bake the jam bars for 35 minutes or until it is golden brown on top. Let cool for 10 minutes then cut into 12 or 15 squares. 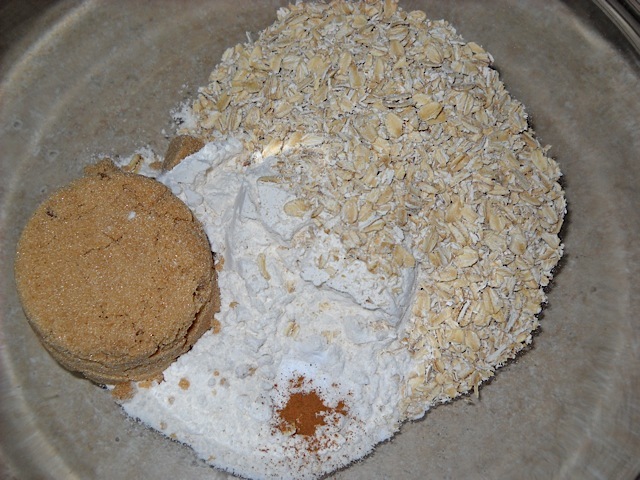 Mix the dry ingredients (flour, oats, brown sugar, salt, baking powder) together in a bowl until no clumps remain. “Smoosh” in the butter (must be room temperature) until it is evenly mixed into the dry ingredients. It should look like the picture above when fully mixed. 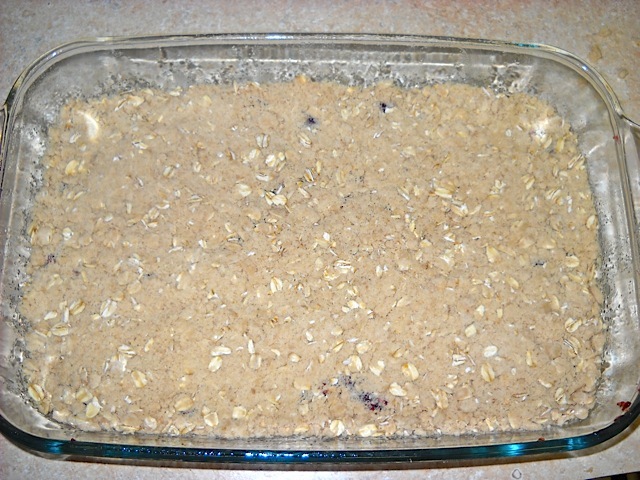 Press half of the crumb mixture into a small glass baking dish coated with non-stick spray. Carefully layer in the rasberry jam, staying a half inch away from the edges. Pour on the remaining crumb topping and gently pat it down. I’m sorry that I don’t have a picture of the jam layer. I was distracted by my sister standing over my shoulder demanding to know when these bars would be done… and if she could taste some of the crumb topping… and when the bars would be done… and if she can eat one… you get the picture. Bake the bars for 35 minutes at 350 degrees, let cool then cut and serve! NOTE: This can easily be transformed into a really healthful snack by replacing the regular flour with whole wheat and replacing the jam with an “all fruit spread”. The recipe calls for only 8 Tbsp of butter which means that each serving only contains 2/3 Tbsp (or 2 tsp) of butter. That’s not so bad for a dessert!! I am making these now. They smell great, but I am having a terrible time getting it to brown. Ideas? I added chocolate chips to mine. Oh my! I make these weekly for a sweet treat at work. Love this website! I enjoy cooking and eating again. I doubled the recipe (used a full sized casserole dish and added about 5 minutes in the oven) and made these with strawberry jam. They turned out so well! I had everything in my pantry already except the jam, so these were really easy to throw together. Thank for the recipe! I will definitely try making these to day but can they be pre-cut and put in the freezer for a later date? Also I have some fresh blueberries kicking around that I want to use up can I put a layer of the blueberries on top of the jam or would it be to wet? I think they’ll be too wet, unfortunately. The oat topping won’t be able to crisp up with all the juice from the fresh berries. These turned out pretty great even though I accidentally cooked them for almost twice the time. I also used rolled oats because that’s what I have. One of those two changes may be why they were more crumbly than optimal. Next time, I’ll bake them for the recommended time and see if that makes a difference. If not, perhaps rolled oats call for a little more liquid. I tried it two ways: 1 pan with strawberry jam and 1 pan with apple butter + 1 granny smith apple. The strawberry was great (raspberry probably would have been better). For the apple, I would recommend using 2 apples rather than just 1. I think this is a great springboard recipe and plan to try it a whole bunch of different ways, mostly with different fillings. But I’d also like to try replacing some (or all, if possible) of the flour with oat flour for that full oat-y flavor, replacing some/all of the sugar with honey, and replacing the butter with coconut oil. I know I didn’t cook it as you wrote it, but thanks for a great recipe! So awesome and simple – my kids looked at the bars suspiciously at first and now they are absolutely hooked! 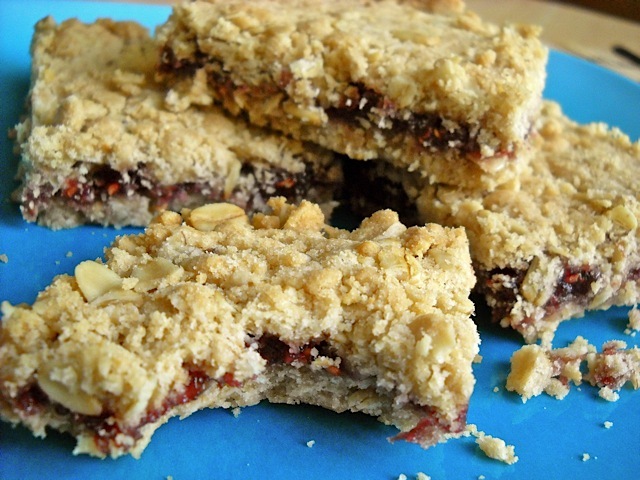 Delicious oatmeal crust layered around raspberry preserves. AND…absolutely budget friendly and easy to throw together…win-win!! !